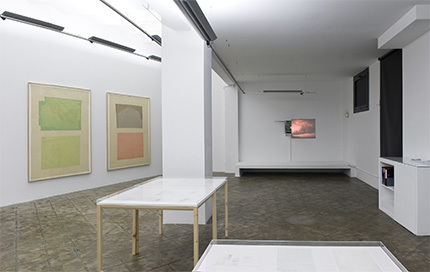 El Gran Cercle (The Great Circle), gathers a series of new works which are the result of the artist’s research in 2011 during a residency in New York. The Great Circle is a term used in geometry to define any circle drawn on a sphere with its centre in the sphere’s centre. Great circles represent the shortest distance between two points anywhere on the Earth’s surface. They have been used in navigation, cartography and geography for hundreds of years and knowledge of them is essential for long distance travel across the globe. The Great Circle serves Dauder as a metaphorical title to establish an analogy between the term’s meaning, a measurement, always approximate, never accurate or even real, to make two distant points closer, and the own artist’s experience in the attempt for shortening the distance between thoughts and artwork, to link self-examination to exposure. In this probably impossible task, the exhibition results in a highly introspective exercise, where the idea of a landscape, a mental space, or a journey are evoked, all recurring subjects in the work of the artist. 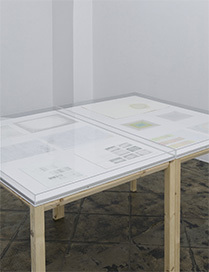 Displayed on tables, Sun, Cinema, World and Extensions, are sets of drawings, where a microcosm of free associations seems to be established. Difficult to classify despite their composition in groups, they are highly explorative, experimental, diagrammatic drawings where the concept of mapping as a visual representation of an idea, seems to be suggested. Garden Island is a new 16 mm film shot on location in Kauai, where the artist travelled to and exposed herself to a supposedly ‘paradise’ site. Film is being used in a very essential manner, to depict through a sequence of long colour and black and white shots, very few images of the visited place. 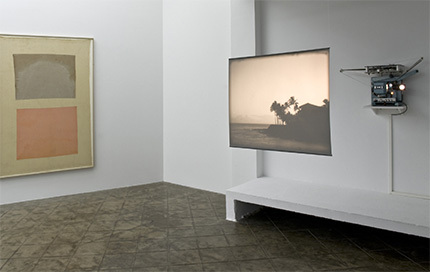 As it is typical in Dauder’s film works, the film is in itself an experimental essay, extremely simple, deprived of any narrative, of evident sensory richness and certain pictorial quality. Despite the ‘beauty’ of the shots and the location itself, a certain detachment and remoteness is perceived. In the ‘drawings’ on textiles Untitled, Green Kauai and Orange Kauai, a distant place, a landscape, either visited or unknown is referred to, in a total non-representational fashion. It is interesting to note that these works are produced through a process of subtraction in the sense that colour is obtained after bleaching out fabric which was originally dark, and after overlapping (sewing) various layers of linen. The works reflect the difficulty in addressing the ambivalence between an evoked image and the resulting object-image highly self-referential. 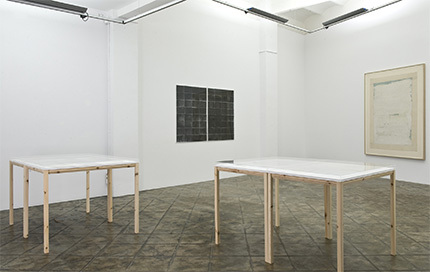 The double Subway Series contrasts with the chromatic spectrum of the rest of the works in the exhibition. These works on paper, at first sight appearing as quickly processed are, on the contrary, the result of a rather slow process. They are all small drawings which respond to the self-imposed routine of drawing during displacements, while travelling either by subway or train, with a pen on an A5 format notebook, in a sort of automatic manner, with no pre-conceived purpose. The original fast sketches were later selected, scanned and laser-printed on paper to be finally redrawn, sort of blackened out, and grouped in two compositions. 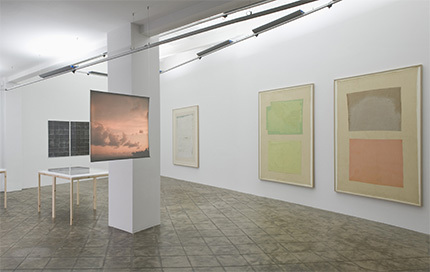 According to Patricia Dauber, ‘what started as a processual exercise has become a sort of map, a kind of cinematic story-board, a symbolic depiction of a non-existing place’.